“Summer of what?” You ask. Rosé. Duh. My goal is to provide you, my dear readers, with a new rosé to seek out and try. Hence, the title…Summer of Rosé. I will forewarn you, some of the wines are only available through the tasting rooms. I will do my best to provide you with the information necessary to order these wines. For over fifty years, Rodney Strong Vineyards has been associated with world-class wines. After retiring from dancing in 1959, founder Rod Strong said, “I knew I couldn’t be an old dancer, but I could be an old winemaker,” (Source) when asked about his second career. It was also in that year that he married his dancing partner, Charlotte Winson. They moved to Northern California, bought an old boarding house and began making wine. Rod made the wine, which was purchased in bulk, then blended and bottled it to his liking in the cellar, while Charlotte ran the tasting room on the ground floor. After growing Rodney Strong Vineyards for 30 years, Rod Strong sold the winery to the Klein family. The purchase by the Klein family brought new innovations and techniques. The continued growth under the control of the Klein family has made Rodney Strong not only a known name in the wine market, but a respected one at that. For anyone who is from Clark County, WA and is reading this, I have a tidbit of knowledge for you. Did you know that Rod Strong was born here in our beautiful county? He was born in Camas! At least for me, this is a reason to drink even more Rodney Strong wines. You may ask, “Is Alina’s thought process on this completely twisted?” Most likely, but here’s my reasoning: even though this is a California wine, there are still roots connecting the winery to Clark County, so I still consider them to be “local” because their founder is one of us. And admit it…we all have a soft spot for our locals who have done something amazing, even if they haven’t lived here in decades. This area will forever be known as their hometown. In Rod Strong’s case, his hometown was Camas, therefore, he was a local. While he didn’t grow his empire here in the county, the roots of his legacy still lead back to the SW Washington region. And that is what matters…where do the roots lead you to? 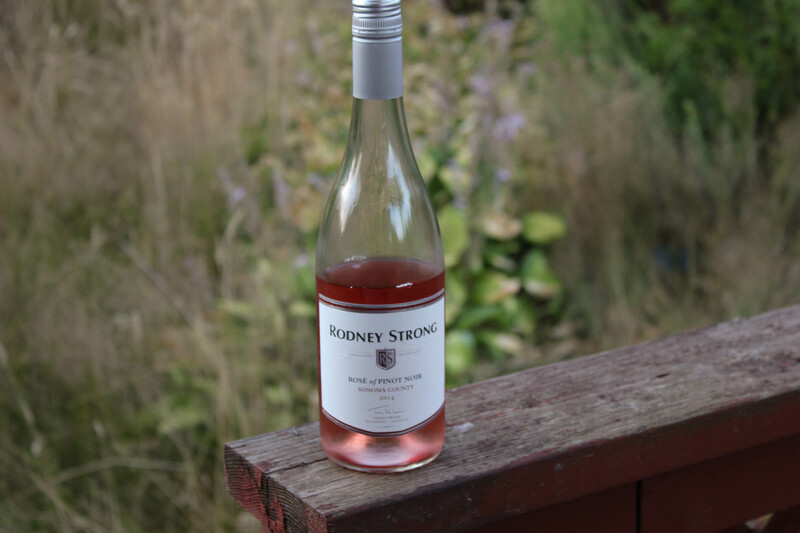 When I saw that Rodney Strong Vineyards had released their rosé via a Facebook post, I immediately made a mental note to snag a bottle. Why? Every once in a while, I need to step outside of my comfort zone. I know, I know…I sing the praises of Oregon and Washington wines. I’m from the Portland area. I kinda have to. I consider it my duty. But we all have those moments where we have to deviate from our paths. This was a definite step outside of what’s familiar to me with regards to Pinot Noir, but it’s also very reminiscent to what I’m used to. On the nose, there’s a bountiful amount of cherries (familiar), but there are also faint hints of peaches (unfamiliar). The palate brings a bright acidity and tart strawberries. The acidity is offset on the finish with sweetness from rose petals. The balance of acidity and sweetness makes this a great food wine. I’d honestly pair this Sonoma County Rosé of Pinot Noir with anything that I’d pair an Oregon Rosé of Pinot Noir with. Salmon. BBQ fare. Heck, I’d even toss it in as a ringer in a blind tasting, just to see if anyone could detect a difference! Add this to your collection. I know that I will be purchasing more before the summer is over.